The potential tax changes in the proposed Tax Cuts and Jobs Act (TCJA) are extensive and far-reaching. Given that the House and Senate versions are not identical, there is no way to predict precisely where it will go. However, the proposal does raise the standard deduction, which means that going forward taxpayers will need to provide more itemized deductions in order to receive the tax benefit of excess deductions. 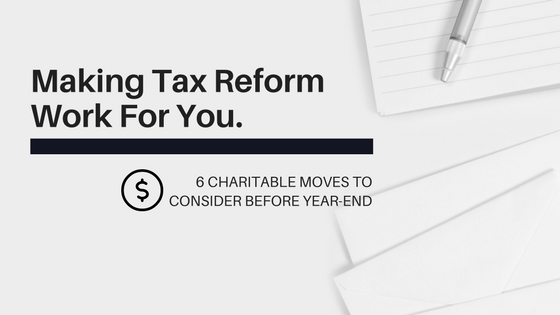 You might want to consider these six charitable planning moves before the end of the year given expected changes. Donate highly appreciated stocks or mutual funds. The stock market has been on a terrific run, and you may have highly appreciated stocks or mutual funds that you are holding on to because you do not want to pay capital gains taxes. By donating appreciated investments to a qualifying non-profit, including the Southeast Virginia Community Foundation (SEVACF), you avoid paying the capital gains tax and can take a deduction for the fair market value of the investments. If you are considering gifting mutual funds, do so before they declare their year-end dividends and capital gains and you will save on taxes by avoiding that income as well. While your deduction is limited to 50% of your Adjusted Gross Income (AGI), you can carry the unused portion to future tax years. If you want to create a legacy or are unsure of where to contribute, use a Community Foundation or Donor Advised Fund (DAF) to max out your contributions. For example, if you give $50,000 to a DAF, you can deduct the entire amount now but designate your gifts and charities over time. You can invest the portion of your DAF that is not immediately donated to a specific charity, creating the potential for even greater giving in the future. You can establish a DAF with SEVACF for as little as $5,000. Donate your extra property, clothes, and household items to charity. Make time to clean out your closets, spare bedroom and garage, and donate those items to one of the many charitable organizations in our area. CHKD, Salvation Army, Purple Heart, ForKids, and Hope House are just a few organizations that will take old clothes, appliances, household items and furniture. Some of them will even come to you to pick up items. Make sure to ask the charity for a receipt and keep a thorough list of what you donated. You can use garage sale or thrift store prices to assign fair market values to the donated items, or you can use online programs (such as itsdeductible.com) to figure out values. Make a Qualified Charitable Distribution (QCD). We discussed this charitable donation method in detail in a column last year, which can be found here: http://bit.ly/2Ak1qAr. Essentially a QCD allows you to donate all or a portion of your IRA Required Minimum Distribution to a qualifying charity. The donated amount is not included in your taxable income and also helps to lower your income for certain “floors” like social security benefit taxation and Medicare Part B and Part D premiums. QCDs are very tax-efficient ways to make charitable donations. Please call the SEVACF office, at (757)397-5424 for more information or assistance in making a tax-deductible contribution before year-end. About the author: Stephen Korving, a CERTIFIED FINANCIAL PLANNER™, co-founded Korving & Company in 2010 along with his father, Arie Korving. In 2015, Korving & Company was honored by the Hampton Roads Chamber of Commerce as the Small Business of the Year in Suffolk, VA. Korving & Company specializes in providing financial advice to people who are preparing for retirement, are currently retired, or who have recently lost a spouse due to death or divorce. For more information about the author and Korving & Company, visit www.korvingco.com. Disclaimer: This material has been prepared for general information and educational purposes only, and is not intended to provide, and should not be relied on for, tax, legal, investment, financial planning or accounting advice. You should consult your own tax, legal, investment, financial planning and accounting advisors before engaging in any transaction.